We have been given the most beautiful, huge pieces of hake and as this fish can take on so many wonderful flavours, I decided to make use of the anchovy butter with olives and caper berries to sauce it up. Hake is a locally caught fish and there are quite a few companies in the Western Cape that trawl for hake. We don’t often eat it and over Easter you will find that this fish is quite expensive. At that time of the year I tend to buy frozen hake which is filleted and packaged at sea in most instances. The rest of the year, when the fish are in abundance, hake is quite reasonably priced. We are eating raw this month and I think this post sums up what I miss most. Fish, capers, anchovy butter… yum! What an interesting flavor combo, I love it. This looks great Tandy! 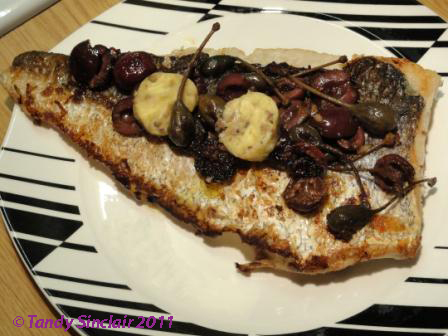 Hi Tandy, Caper berries and olives make your fish dish a stand out. How weird, I made skate with capers last night and was going to do a post soon! This looks lovely with the anchovy butter – wish I´d thought of that! There was not enough space on the plate LOL!